The Quattro Pezzi were composed for Peter Sadlo in 1990. A whole variety of percussion instruments is grouped around the solo instrument, the vibraphone. In the Prologue (I), mainly vibraphone and metal sounds determine the various tonal characters and "invocative gestures". The Allegro con brio (II) provides a toccata-like framework for drum-head, wooden and metal sounds and features 2 vibraphone solo passages; a melody reminiscent of jazz music and backed by a "stubborn" ostinato figure attracts the listener's particular attention. A la Sarabande (III): A fantasy based on a sarabande rhythm and consisting of several parts gives the player an opportunity to fully explore the vibraphone 's tonal possibilities. Vivace (IV):A march episode forms the core of this virulent-virtuoso finale movement- sometimes grotesquely alienated, sometimes containing a hymnic interpretation. After the movement's beginning has been repeated in the form of a Variation, the coda briefly quotes a sequence of notes from the prologue; finally, a stretta provides an effective conclusion to the work. The four "pezzi" that comprise this tightly-written and well-planned work for solo multi-percussionist explore the tonal possibilities of a large assortment of instruments, while using the vibraphone as a focal point. In the "Prolog", metallic timbres contributed by crotales, triangle, sizzle cymbal, gong and tam-tam produce a rich amalgam of sound, especially when wedded to the sonority of the vibraphone. The second movement introduces membranophones and wood timbres, with the vibe contributing solo passages and an insistent ostinato pattern. The composer describes the third movement, a vibe solo with subtle embellishments on metallic percussion and vibraslap, as "a fantasy based on a sarabande rhythm." The last movement, appropriately titled "Vivace" uses a multi-metric scheme and rapid tempi, especially in the final section (Quarter note = 152), ending the work on a virtuosic note. 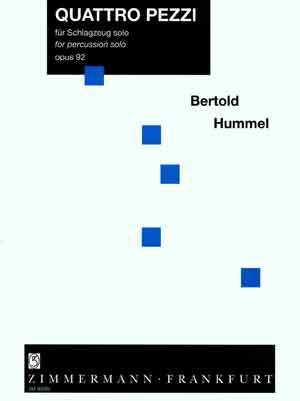 Hummel's style is eclectic, using everything from chromaticism and passages relying on whole-tone patterns, to seventh chords that impart a distinct jazz flavoring. The thirty-three individual instruments that must be huddled in proximity to the vibraphone will require an ingenious setup. However, the college percussionist who solves that challenge will reap the benefits offered by this excellent work.